Saudi Arabia is officially referred to as the Kingdom of Saudi Arabia. It is a sovereign Arab state located in Western Asia as part of the Arabian Peninsula. It is the second-largest state in the Arab world measuring 830,000 square miles (2,150,000 sq. km).Geographically speaking, Saudi Arabia is the largest country in the Arabian Plate. The country geography is mostly accounted for by the Arabian Desert. The country is rich in cultural, hand historical significance. What are the 7 Wonders of Saudi Arabia? The Great Mosque of Mecca is the most significant holy place for the Islamic religion. It is the largest mosque in the world capable of holding 900,000 worshippers regularly and expanding to 4 million during the Hajj period. 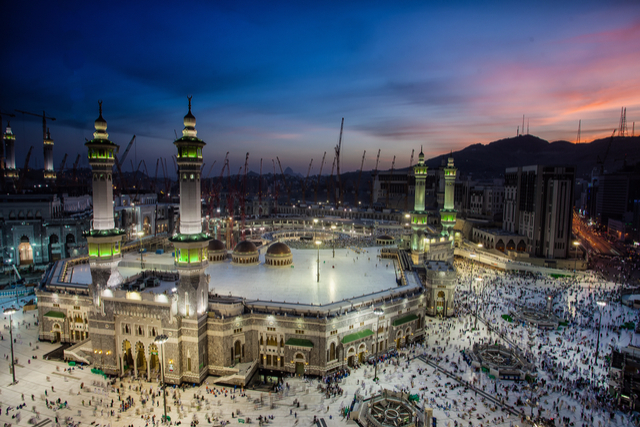 The Great Mosque of Mecca is also known as the Grand Mosque of Makkah. The mosque surrounds the Islamic Qiblah, Direction of Prayer, that is the Kaaba in the Hejazi city of Mecca. Muslims face the Kaaba during the Islamic act of worship known as Salah. The King Fahd Fountain has the distinction of being the world’s tallest fountain. It reaches a height of 853 feet (260 m), which is almost three times as high as the second tallest fountain. The fountain is a daily attraction that displays across the Saudi Arabia skyline providing visitors with a spectacular view. The King Fahd Fountain launches an enormous jet of water into the sky at a rate of 124 miles (200 km per hour). The fountain shoots about seven tons of water into the air at any given moment.